A homespun murder story. This is one of those cinephile classics that we hope you, and everyone you know, has seen. Even though it's a little violent and dark and crazy, it's another superb crime cult classic from the Coen Brothers. 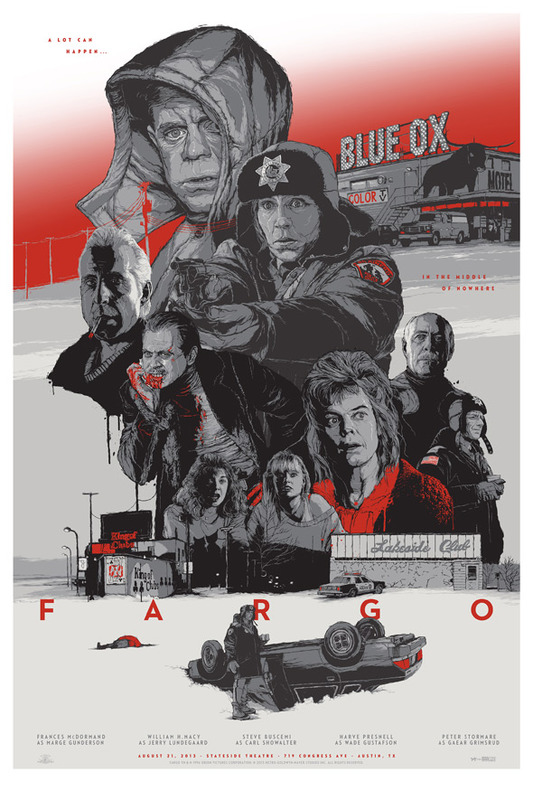 Fargo, from 1996, starring William H. Macy, Steve Buscemi, Peter Stormare and Frances McDormand. Odd City Entertainment has commissioned a new poster designed by Gabz for their upcoming Summer Classic Film Series screening at the Paramount Theatre in Austin, TX, taking place August 21st. I think it's a cool poster for a fun film, and thought it was worth featuring as more unique film art. See below. "Fargo was the first piece Odd City had fully produced with Gabz. There were a lot of late nights and several weeks of back and forth to make sure this piece was perfect. The versions that had been considered and dismissed could fill a book. There were people with their heads chopped in half, outrageously brilliant colors, and even a landscape version… All he had to do was let his imagination run wild. I believe he nailed it." For more info or to buy, visit oddcityentertainment.com (tip via Collider). Paramount Theatre Fans will receive priority when purchasing prints. A portion of the proceeds will go to benefit the Austin Film Society. This poster, while great, needs more Shep Proudfoot and Stan Grossman.